The decline in soil fertility is widespread in Malawi and is threatening food security in the country. While the use of inorganic fertilizers to improve soil fertility has immediate results, the escalating prices make it impossible for the majority of smallholder farmers to use them. There is, therefore, need for alternative low-cost soil fertility enhancing technologies. Compost manure seems to be a viable option to be promoted. This study was designed to assess the adoption of compost manure making and utilization by smallholder farmers. The study was conducted through a combination of individual interviews and observation of 150 smallholder farmers as well as through focus group discussions. Key recommendations for compost manure technology were identified through consultations with the Ministry of Agriculture and Food Security. Based on the key recommendations, a knowledge test was constructed to assess knowledge of the technology and a checklist was designed to assess farmer practice. The study revealed that the most critical factor that affected the adoption of compost manure technology was knowledge. Given that knowledge is a pre-requisite to any technology adoption, farmers knowledge on composting will therefore need to be raised substantially before appreciable levels of adoption can be expected. The amounts of compost that farmers made fell far short of their annual needs because of the late timing of the actual compost manure making. However, farmers have a positive perception of the compost manure technology as they believe it improves soil productivity. There is a growing awareness that land degradation and soil nutrient depletion have become threats to agricultural productivity in Malawi (GOM, 1998; Chinangwa, 2006). As a result, the national average maize yield has been declining and is now estimated to be 1.08 metric tons per hectare, which is low compared to 3-4 tons obtained at research stations (GOM, 1998). In order to improve maize yields and attain food self sufficiency, sustainable soil fertility improvement technologies need to be promoted. These include organic and inorganic sources. Replenishing soil fertility with inorganic fertilizers at the recommended rate and appropriate time is constrained by high price of fertilizer. As a result, the Government of Malawi decided that fertilizer subsidy is a major priority for resource poor smallholder farmers and introduced the Farm Input Subsidy Programme (FISP) in 2006. Spurred by the successes of the programme, the government has been raising the level of subsidy over the few years the programme has been in operation. Consequently, farmers are paying only a small fraction of the actual cost of the fertilizer (Table 1). Over the four year period, government input subsidy rose from 70% to over 90%. Government has clearly recognized that farmers would never be able to cope with the escalating fertilizer costs without FISP. Farmers who manage to get fertilizer are also faced with the continual depletion of soil fertility such that they have to increase the amount of inorganic fertilizers every year (Waddington, et al., 2004). Good soil management becomes crucial for maintaining and improving soil productivity. This can be done by building up and maintaining soil organic matter (Nakhumwa, 2004). Soil organic matter is a major tool in the creation and preservation of soil fertility (Murwira, 1994). Compost manure has been part of the extension programme since the start of extension in Malawi but little is known about the extent of its adoption. This study was designed to: assess farmers' knowledge on compost manure making and utilization; establish the extent to which farmers follow recommended practices on compost manure making and utilization; identify factors influencing its adoption; determine farmers' perceptions on the technology; and, identify opportunities for improvement. The study was conducted in Balaka District in southern Malawi. Key recommendations for successful compost manure making and utilization were identified from the training manual of the Ministry of Agriculture and Food Security. These included: importance of compost manure; composting methods; dimensions for each method; composting materials; composting process; and, compost application rates. Based on the key recommendations, an oral test was constructed to assess farmers' knowledge. A checklist with a Likert scale for each question was constructed to assess the extent to which farmers followed recommendations. Smallholder farmer interviews were conducted at Rivirivi and Mpilisi Extension Planning Areas (EPA). Selection of households was done using simple random techniques and respondents were household heads. The sample size was 150 households. Two models were used in the study namely Logistic and Multiple Regression model to examine the variable that influenced production of compost manure and to determine the factors that influenced adoption and farmer perceptions on the compost manure technology respectively. Farmers' knowledge on compost manure was assessed using an oral test. Each farmer was asked questions on the recommendations (importance of compost manure; composting methods; dimensions for each method; composting materials; composting process; and, compost application rates) and scores were given. About 90% of the farmers scored less that 50% (Table 2) with a mean score of 35.3%. This was surprisingly low as compost manure is an old technology. However, a possible explanation to this low knowledge is the low extension worker to farmer ratio which was 1:2800. There was no significant difference between females and males on knowledge scores above thirty percent (p≤0.05). However, significantly more females scored below thirty percent (p=0.054) than males. This is possibly because women are less likely to attend all trainings given by extension workers given other multiple family demands on their time. After the oral test, each farmer was assessed on how they applied the recommendations when making and using compost manure. Compost heaps and pits were assessed based on recommended specifications. Only 48 (32%) of the 150 farmers surveyed used compost manure. Most farmers preferred inorganic fertilizers which provided immediate benefits. Four composting methods were recommended in Malawi. These were chimato (mud insulated), pit (dug), changu which means 'speed' because of the short time it takes to mature (also commonly known as Chinese or speed) and box (which is box shaped and grass thatched) - (see Plates 1-4 below). The study revealed that chimato (mud insulated) and pit were the most commonly used methods. Just a little over 50% of those who made compost manure reported that they frequently used chimato method because it was easy to make and was commonly promoted by frontline extension staff in the area. About 46% of the farmers that made compost manure reported that they chose pit method because once a pit was dug, they used it several times. However, for those that made compost manure, the amounts they made were so little that it covered only 17% of their land. The average land holding size for the area was 0.9 ha per family. 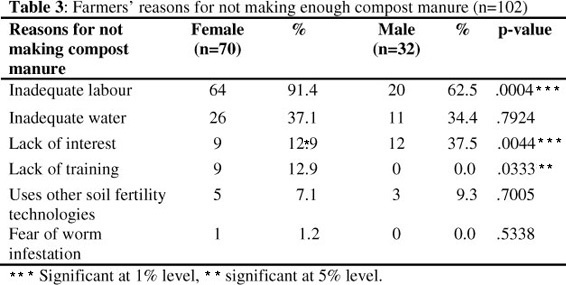 Lack of interest, training and labour were among the reasons for not making enough compost manure (Table 3). Farmers reported that they started composting in May. During this period most of the composting materials (grass, crop residues, water) become scarce hence they have to walk long distances looking for them. More females than males complained that they did not have enough labour (p< 0.01). This was possibly because females are already overburdened by household chores. Both said that they did not have enough water for making compost manure. A significantly higher percentage of men than women indicated that they lacked interest in the compost manure technology (p≥0.01). A possible explanation to this is that Balaka district practices matrilineal system of culture where a husband stays in the wife's home and normally land is owned by women. For some men this was a disincentive to invest in compost manure which has more long term than short term benefits because they did not own the land. Some women mentioned that they had not been trained. Training empowers farmers with information which they use when making decisions on whether to adopt a technology or not. Some farmers reported that they did not make compost manure because they used other soil fertility improvement technologies like livestock manure and incorporation of crop residues soon after harvesting. The study explored the major demographic and social factors of farmers that were related to the adoption of compost manure. Explored factors were age, education, crops grown, labour source, household size, household headship, marital status, field size, land ownership, knowledge on compost manure technology and farmer training (Table 4). 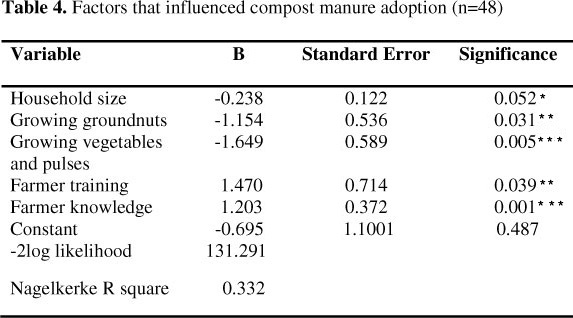 In the logit model, compost manure adoption was taken as the dependent variable which was influenced by the independent variables. Farmer knowledge, household size, training, groundnuts and vegetables as well as pulses significantly influenced adoption of compost manure. A significant negative effect was observed on farmers growing groundnuts in the area (p=0.031). Farmers reported that they did not apply compost manure to groundnuts because groundnuts usually will do well without fertilizers. Groundnuts belong to legume plants which fix nitrogen in the soil. The nitrogen that is fixed in the soil is used either by groundnuts themselves or by other plants the following year. An increase in the number of household members was negatively related to the adoption of compost manure. This sounds illogical because the expectation would be that if the household has more members, more labour would be available for making compost. However, as the number of household members increased, farmer participation on compost manure decreased. A possible explanation is that most adopters were middle-age parents (30-49 years) with children still at school. Hence, school-going children would not have been available for making compost. An increase in farmer training on compost manure making and utilization is likely to increase the adoption of compost manure in the area. Farmers were able to adopt the technology because they were empowered with information. Knowledge of the compost manure recommendations was positively related to compost manure adoption (p=0.001). Farmers that had more knowledge on compost manure understood the importance of making and using compost manure and eventually adopted the technology. Intensification of extension services will likely increase the adoption of compost manure in the area. Analysis of the adoption potential of compost manure can only be done if issues concerning compost manure are understood from farmer's perspective (Scoones, 1999; Scaborough, 1997). Farmers willingly adopt technologies that contribute positively to their livelihood. There were no significant differences between females and males in terms of their perception on the compost manure technology (Table 5). Farmers reported that compost manure was helpful because when they applied there was increased soil productivity (p≤ 0.05). They also indicated that they were able to harvest more when they combined compost manure with application of the inorganic fertilizers. However, farmers complained that they did not harvest much if compost manure was used alone in the area. Through brainstorming, a focus group discussion conducted with 34 participants to rank the technologies in order of importance showed that there were five other soil fertility improvement technologies being recommended to farmers in the study area. After thorough discussions of each technology, ranking was done through voting. These technologies included inorganic fertilizer, residue incorporation, conservation farming, livestock manure and agro-forestry. Farmers perceived inorganic fertilizer as the best in providing immediate benefits and residue incorporation was ranked second because it required less labour than composting which was ranked third. Conservation agriculture was ranked fourth because it was still a new technology. Due to few livestock, manure was ranked fifth. Farmers ranked agro-forestry sixth because it had recently been introduced and was still less well understood. After coming up with preliminary results from individual interviews, another focus group discussion was organized to give feed-back of the results to farmers and to explore ways of dealing with the challenges raised in the survey. Thirty six farmers participate in the focus group discussion. Among the main challenges raised in the survey were inadequate labour, water, livestock manure and lack of interest. These problems were presented on flipcharts and, through a process of brainstorming, the group suggested solutions. After some thorough discussions of each suggested solution, the most promising solutions were identified through voting. The experiences from the focus group discussion showed that farmers themselves can come up with solutions to their problems. The position of the traditional leaders in a society and the way the society relates to them represents an opportunity for enhancing adoption of improved agricultural technologies. Table 5 summarizes the results from the focused group discussions. An interesting dynamic during the focus group discussion was the influence of other needs. During dry periods of the year, drinking water becomes scarce in the area. The suggestion for piped water, which was accompanied by clapping of hands and ululation, was more to mitigate this problem than compost-making which is best done during the pick of the rainy season when composting materials and water are in abundance. The most critical factor that affected the adoption of compost manure technology was knowledge. Farmers' knowledge on composting was low. Given that knowledge is a pre- requisite to any technology adoption, farmers knowledge on composting will therefore need to be raised substantially before appreciable levels of adoption can be expected. The role of extension services in promoting compost manure technology is very crucial. Therefore extension needs to intensify trainings and demonstrations on the use of compost manure as well as inorganic fertilizers to improve farmers' knowledge and perception of the technology. These should be done through groups for social support, encouragement and experience sharing. For the few farmers that were engaged in composting, the amounts that they made fell far short of their annual needs and the main reason revolved around the timing of the actual compost manure making. Compost manure should start during the peak of the rainy season (February) when composting materials and water are abundantly available to reduce labour demands. The same labour can achieve more since people do not have to walk far to get the materials and water. The experiences from the focus group discussion showed that, given a chance, farmers themselves can come up with solutions to their problems. The position of the traditional leaders in a society and the way society relates to them represents an opportunity for enhancing adoption of improved agricultural technologies. Engaging traditional leadership in the promotion of compost manure technology will improve production and adoption of the technology because traditional leaders occupy positions of respect and they are listened to. Engaging local leadership in the adoption of agricultural technologies will also complement the current staff shortage. P. O. Box 219, Lilongwe, Malawi.